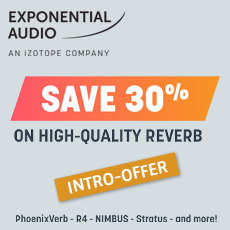 Symphony 3D is Exponential Audio’s flagship reverb offering. The character reverb engine of Symphony receives 24-channel surround support, making it perfect for crafting distinct, captivating spatial effects for any multichannel music or post projects. With independent parameter modules for the Attack, Early Reflections and Tail of your reverb signal, plus channel-specific Balance controls and creative modulation and dynamics effects, no other reverb plug-in gives you this much control over your multichannel reflections.